1. Kinematics of a Particle. Motion of a particle. Trajectories. The velocity concept. Acceleration. Motion of a particle in curvilinear coordinates. 2. Kinematics of a Body. Analysis of the motion of a continuous medium. The general motion of a rigid body. Relative motion. Plane motion of a rigid body. Examples of the determination of velocities and accelerations in the motion of plane mechanisms. 3. Particle Dynamics. Fundamental definitions and theorems. Rectilinear motion of a particle. Curvilinear motion of particle. Centre of mass and centre of gravity of a particle system. Law of variation of momentum. Law of variation of angular momentum. 4. Fundamentals of the Dynamics of Continuous Media. Preliminary concepts. Body and surface tension. The law of variation of momentum for a continuous medium. The law of variation of angular momentum for a continuous medium. Work and energy in continuous systems. Comments and addenda. 5. Dynamics of Rigid Bodies. Moments of inertia of rigid bodies. The angular momentum of a rigid body in general motion. Angular motion in circular motion. Euler's equations. The kinetic energy of rigid bodies in general motion. 6. Dynamics in Relative Motion. Differential equation of the motion of a particle in a non-inertial system. The dynamics of rigid bodies in relative motion. 7. Statics and Dynamics of Some Solids and Liquids. Preliminary discussion. The elastic body. Clapeyron's systems. Viscoelastic bodies. Pascal's liquid. Viscous liquids. 8. Fundamentals of Analytical Mechanics. Generalized coordinates and degrees of freedom of a mechanical system. D'Alembert's and Hamilton's principles. Lagrange equation of the first kind. Lagrange equation of the second kind. The problem-of motion of mechanisms. Kinetic energy of a system. Impulsive motion. Gyroscopic and dissipative forces. The Lagrange equations for electromechanical systems. Hamilton's canonical equations. The total energy of a mechanical system. Configurational space. The stability of mechanical systems. 9. Vibrations of Systems with One Degree of Freedom. Preliminary discussion. Free vibrations of harmonic oscillators. The influence of dissipative forces on the free vibration of harmonic oscillators. Forced vibrations of harmonic oscillators. Vibrations of harmonic oscillators with kinematical inputs. Vibrations of harmonic oscillators under periodic input (exciting) forces. Vibrations of non-linear systems. 10. Vibrations of Systems with Many Degrees of Freedom. Preliminary discussion. Problems of linearization of the equations. Free vibrations of conservative systems. Normal coordinates. Forced vibrations of a system. Free vibrations of dissipative systems. Forced vibrations in dissipative systems. Vibrations of Clapeyron's system. 11. Vibrations of Systems with an Infinite Number of Degrees of Freedom. Preliminary discussion. Solution of a one-dimensional problem. Forced vibrations of a continuous system. Differential equations of vibration for some continuous elastic media. Approximate solution methods. Since mechanics is the science of motion, studies in this field now cover a wider range of problems than has been the case in earlier classical approaches. This has been achieved by the inclusion of aspects relating to the mechanics of continuous media, or strength problems. 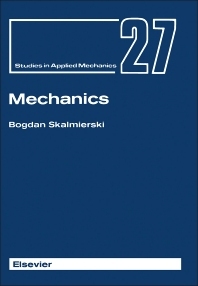 The topics covered in this book present a comprehensive treatment of the subject providing a broader perspective to the meaning of mechanics, in the modern sense of the word. Problems in the areas of strength of materials, hydromechanics and theory of elasticity are examined. The author has also endeavoured to show a certain universality of some methods seemingly specific to mechanics by tackling some problems involving electrical or electromechanical systems but based on Lagrange's equations. The book has been designed to emphasize that mechanics is a deductive system, where the aim is not only to present mechanics as the science of motion but also to show that it serves as a bridge between mathematics and its applications, in the broadest sense of the word. Mechanical problems have inspired great mathematicians to come to grips with new mathematical problems, an excellent example here being the problem of the brachistochrone which initiated the development of the variational calculus. The book gives a comprehensive overview on new theoretical findings, and gives many applications which will prove indispensable to all those interested in mechanical and allied problems.